So for his birthday last year, my lovely in-laws got Peter a complete set of homebrewing equipment. We were quite excited to try making both beer and wine at home, and demonstrated our excitement but putting the kit in our closet and letting it rest for a year. Seriously, why does time move so quickly when I'm not at work? A couple of weeks ago, we finally got it together to visit a brew store and get a couple of ingredient kits. Since my first choice (Pumpkin Spice Porter) is a seasonal beer, not available until the summer, we decided to start with Imperial Nut Brown Ale and Red Ale. Less than a month later, and we've got the nut brown ale conditioning in a secondary fermenter, red ale beginning to ferment in a primary bucket, and a growing list of recipes we can't wait to try. As Peter says, "we're beer people now"
According to the owners of more than 1 brew store, the most important part of the process is sanitation. Accordingly, my kitchen got a good scrub down with bleach before we started. I will let Peter brew anything legal if it means I get to live in this environment. Look, you can see counter space! Preparing the grains to go into the water to steep for 20 minutes. See my monster new brewing pot? 24 quarts, that thing is HEAVY when full. Making sure the temperature doesn't get too high. Over 170 and tannins can start to come out. Even though it looks like she's giving her daddy a rather rude gesture, Gabriella was actually being such a good girl, keeping herself occupied while we worked. Side note, know which game she's playing? OREGON TRAIL!!! Love the Nook! Also, she's a good helper. After boiling for an hour, you've got to get the wort cooled down quickly so that bacteria don't have a chance to establish. Filling our sink with ice water did it in about 20 minutes. The only time in the process that you want to aerate the mixture. Gotta get some oxygen in there for the yeasties! Time to leave the yeast alone to enjoy their feast! I work in a retail setting, and although my current store is far to busy to allow me to keep up with celebrity gossip the way some of my former stores did, I do have a clear view of the magazine display at our checkout counter. 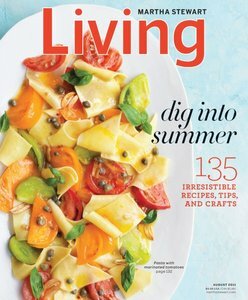 For the last month, the cover of Martha Stewart Living has been teasing me, especially on the days that I don't get a chance to eat. That deliciousness is marinated heirloom tomatoes with pasta, and it is damn near perfection for a summer dinner. We threw this dinner together Tuesday night after I got home from work, so it's a good thing it's a quick and easy meal. It wasn't as garlicky as I thought it would be after reading the recipe, but it had a really great flavor, and it's just so pretty! We used a mix of heirloom tomatoes from the CSA and our garden. Definitely going into the arsenal of recipes to use up tomatoes without making the typical pasta sauce.